Microsoft wants from its users to soon upgrade from their old Windows version of Windows XP, Windows Vista and Windows 7 to the new Windows 8 so for that they are offering many new opportunities for old Windows users. As of now Microsoft itself is offering new package through which Windows 8 users can Get Genuine Windows 8 Media Center Pack for Free with genuine product key from Microsoft but for a very limited time, so if you are running Windows 8 operating system, than you can Download and Install Genuine Windows 8 Media Center Pack for Free with Genuine Product Key from Microsoft and can enjoy all the features of Windows 8 Pro as well as Windows Media Center. If you're not using any Windows 8 edition than you can purchase Windows 8 Pro Pack with pre-installed Windows Media Center for just $69.99 from Windows.com but this offer is also for a limited time. If you're not in mood to purchase Windows 8 Pro Pack by spending money into it than still you can Get Genuine Windows 8 Media Center Pack for Free with Genuine Product Key but for that you have to be on Windows 8 home edition or Windows 8 Pro edition. 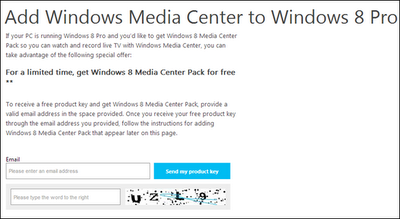 The Free Windows Media Center Pack for Windows 8 offer is valid from October 26th 2012 through January 31st, 2012 but you also need to know that it is limited to one product key for per one email address which means you can get Genuine Windows Media Center Pack Product Key for only your one email address. So If you want to Download and Install Genuine Windows 8 Media Center Pack for Free with Genuine Product Key from Microsoft than follow the instructions and guidelines mentioned below. Step 1: First visit official Microsoft's Windows 8 Media Center Pack website here and then enter your desire e-mail address and the CAPTCHA code on that page after that a product key will be sent to your email address. Step 2: After getting Genuine Product Key than go to in the Search feature of Windows 8, type "add features" and then tap or click (depending on whether you’re using a touch-based system or mouse) on "Settings". Step 3: Tap, or indeed, click "Add features to Windows 8" and if you want to purchase a product key, select "I want to buy a product key online," following the necessary steps thereafter. If you’ve already got your key, select "I already have a product key." Step 4: Enter your product key, and then opt for "Next." You’ll then be prompted to "Add features," after which your desired product will be installed. Step 5: If you were running Windows 8, your PC will restart automatically and Windows 8 Pro with Media Center will be on it. Step 6: If you were running Windows 8 Pro, your PC will restart automatically and Windows Media Center will be available for use. Congratulations!! You're done! For more information about this offer you can head-over to Microsoft Windows 8 official page.